One of the most complex canine behavioral problems a dog owner might face is the issue of dog to dog aggression. Because of the complexity involved, it’s important to look at each case as unique and requiring a tailored approach to solving the problem. Dog to dog aggression is also a very serious issue, as other dogs and even humans can be hurt because of it. If your dog is growling this is the obvious first sign of aggression. Since the problem has potentially grave repercussions, ignoring this aggression is out of the question. This is a problem that won’t just go away without intervention. Thankfully, though, there are steps you can take to solve the issue. There are two main times during which dog to dog aggression takes place. The first is at home with other dogs who share the household. The other type occurs when you’re out for a walk with your pup, and he shows aggression towards other dogs who are out in the community. Controlling dog to dog aggression. This is sometimes referred to as “on leash” aggression. There are also a variety of reasons why this aggression might have cropped up. Sometimes fear or nervousness can bring on aggression. Other cases might stem from territoriality, dominance, a desire to protect an owner, or even from some past reinforcement that resulted in learned dog to dog aggression. Most cases are the result of poor early socialization or some kind of traumatic past experience. To some extent, genetics can play a role, but these factors can be overcome with proper training. If you find that your dog begins acting aggressively, your first step should be taking your dog to the veterinarian. In some cases, aggressive behavior is the result of some medical issue, and only a licensed professional can rule this out. Because the problem is so serious and potentially harmful, you should definitely consider visiting an animal behavior specialist if there is no underlying medical problem that resulted in the behavior. Making sure that your dog receives proper obedience training and socialization early in life can help prevent dog to dog aggression problems from ever forming. Having a truly obedient dog ensures that he sees you, the owner, as a trusted leader whose direction he can follow with ease. Early socialization during puppy hood allows your dog to get a feel for interacting with other dogs in a calm and friendly manner. However, your older dog might be past the point where it’s possible to engage in these preventative measures. If this is the case, there are techniques you can use to put an end to your pup’s aggressiveness. Also recommended is our how to train a puppy section that deals with dog aggression. First, you should recognize that some ideas for controlling dog to dog aggression should not be utilized. Never use punishment or pain in an attempt to frighten your dog into submission. Not only is this not humane, but it is not effective for a dog who is already experiencing a lot of stress. Similarly, head collars and muzzles can prevent altercations simply because their design prevents it; however, they don’t get to the root of the problem. Comforting your dog when he shows aggressive behavior can also be counterproductive. He’ll assume that he is being rewarded for his behavior, and therefore be encouraged to keep it up. While you are at work training your dog to become obedient, there are several concepts to keep in mind. Be aware that your dog is especially sensitive to your emotions, regardless of how you try to hide them. Even your breathing can give away a nervous state of mind, which will not encourage your dog to obey. If you tend to tense up when approaching an unfamiliar dog on a walk, your pup could easily pick up on this and become stressed and anxious himself. If you want your dog to believe that encounters with strange dogs are no big deal, you also have to act and truly believe that it is really no big deal. Teaching your dog to obey a “look” command is also very beneficial for controlling dog to dog aggression. You can use treats and praise to condition your dog to refocus on you when you ask him to “look.” Eventually, just praise and the occasional treat will be enough to reliably have your pup focus on you when given this command. This can go a long way when he shows even minimal signs and controlling dog to dog aggression. Refocusing his attention can provide the distraction you need to let him know that other dogs aren’t threatening or any cause for concern. 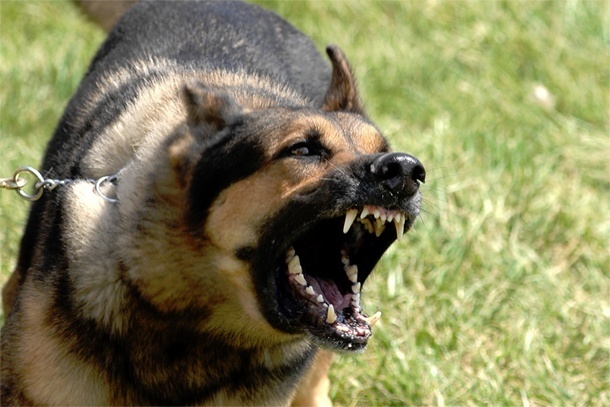 A positive outlet to control aggression is by contacting a professional who specializes in Training A Protection Dog. It can be even more nerve wracking when two dogs living in the same household show aggression towards one another. It can easily be compared to sibling rivalry, where the two vie for resources such as toys, food and attention from their human counterparts. Each dog in the household wants to be dominant, which can create controlling dog to dog aggression problems. Some problems are easy to fix. For example, if there is an ongoing fight regarding ownership of a certain toy, take that toy out of the equation. The dogs are most likely vying for a position of dominance in the household hierarchy, which is something they will inevitably work out on their own. You must simply respect this fact and work with it, while make sure that all of your pups are exercised and stimulated practically more than enough. While dealing with and controlling dog to dog aggression can be a trying process, it can be very rewarding when you and you pup (or pups!) overcome these issues. The problem is serious, but can be effectively dealt with as long as you take the proper steps to move beyond this issue. Some myths are the red nose pitbulls are naturally aggressive. This is not true, and the dog’s temperament as an adult depends on the amount they are socialized as a pup as well as trained. We recommend reading more about dog aggression as well as other training methods for dogs. One of the key steps you can take to avoid having problems controlling dog to dog aggression in the first place, is socializing your dog as well as puppies. It’s a great idea to start socializing your puppy as soon as they have all of their required shots. This is the number one defense in preventing owning an aggressive dog. These are just a few ideas to get your dog around as many different breeds and ages of dogs as possible. It would be a great idea to socialize your pit bull puppies at an early age if they come from an aggressive bloodline. This will insure they will not grow up to be aggressive. This will make controlling dog to dog aggression more manageable.